Posted on April 25, 2018 at 11:48 am. It’s really no surprise that peer-to-peer fundraising has seen a boost in popularity alongside the rise of social media. After all, this fundraising strategy relies on social networking. Social media makes it easier than ever for your supporters to directly appeal to their social networks! But the value of peer-to-peer fundraising campaigns isn’t just measured by the number of new donors your supporters are able to reach. good work you do for your community. Choose the right peer-to-peer fundraising platform. Coach and encourage your fundraisers. Host a peer-to-peer fundraising event. Ready to lead your most successful peer-to-peer fundraising campaign to date? Keep reading! The best peer-to-peer fundraising campaigns are also the easiest to participate in. Your fundraising volunteers have to do a lot more work to serve as peer-to-peer fundraisers than just submitting a donation through your online form. Individual fundraising pages for your supporters. They should be able to update the images and videos on their pages, share them easily across social media platforms, post updates, and display badges for milestones achieved. One central campaign page for your nonprofit to keep track of the overall campaign. You should be able to display a leaderboard, track overall donations with a fundraising thermometer, and give shoutouts to individual fundraisers. Communication features for your nonprofit to stay connected to individual fundraisers. You should be able to share documents and messages with your fundraisers, and they should be able to easily respond with any questions they have. With these features, your fundraisers will feel confident that they’re prepared to raise money for your cause. They won’t be intimidated by the process! Besides making the actual fundraising process easier for your fundraisers, you can also encourage participation in a peer-to-peer fundraising campaign with the right coaching. When we say coaching, we mostly mean providing useful materials to your fundraisers. You have to keep in mind that as passionate as your supporters are, they likely aren’t professional fundraisers! They don’t have the experience you do, so you have to give them basic tools if you want them to have a fighting chance at reaching their goals. Pre-written posts for sharing their fundraising pages on social media. Suggestions for how to share the stories that will encourage donations. Branded images and videos to post on their fundraising pages. Fundraising letter templates, like these from Qgiv! Badges for their fundraising pages when they meet donation milestones. There are other ways to keep your fundraisers from getting discouraged. Namely, to foster some friendly competition among your individual fundraisers! You should ensure that you keep your leaderboard updated with the highest-earning individual fundraising pages. Send out regular messages alerting all participants to their new positions on the leaderboard. Online fundraising is easy to share and spread to a wide audience. But sometimes, you need an in-person fundraising event to harness your supporters’ passion for your cause. Often, fundraising events are incorporated into peer-to-peer fundraising campaigns from the beginning. For example, your nonprofit could host a charity walkathon for breast cancer research and use a certain amount of peer-to-peer fundraising revenue to earn a place at the starting line. But what about a closing event to celebrate the end of a successful peer-to-peer fundraising campaign? Seating attendees based on their peer-to-peer fundraising performance. Awarding the top fundraisers onstage during the height of the event. Showing screenshots of the top fundraising pages on the big screen. Projecting your fundraising thermometer at the front of the room. If you make sure to list these perks in your initial campaign launch materials, your participants will be motivated to raise more to earn them at the closing event! Peer-to-peer campaigns are great choices for nonprofits who want to truly engage their supporters. With these tips, you can do just that! Posted on April 4, 2018 at 11:50 am. Nearly four months ago, Congress passed the Tax Cuts and Jobs Act of 2017 (TCJA), legislation that could impact charitable giving in a number of significant ways. By now, we’ve all heard the projections: itemizers could decrease by 27 million and giving could drop by as much as $20 billion in 2018. Since the bill’s passage, nonprofits have taken action to dampen the effects of these worrying statistics. Many organizations encouraged donors to give before the end of 2017 to receive the greatest tax benefit for their contributions; we shared similar advice last December. How will individuals and families respond to losing the tax incentive to give? Will the doubling of the standard deduction and the estate tax exemption prompt donors to reduce their giving? If the new tax law does impact charitable giving, will the effects be felt evenly across the sector, or will certain organizations bear the brunt of the impact? Will the TCJA launch a period of accelerated economic growth, increasing Americans’ disposable income? If this happens, will people respond by giving more to the causes and organizations that matter to them? Will social programs be cut to reduce the budget deficit created by the tax law, increasing the need for nonprofit support and placing greater demand on certain organizations? In communicating with donors, now is the time to emphasize your case for support—why your mission matters and what makes your organization capable of doing this important work. Tax incentives are not the sole reason people give, and there is strong evidence that they are not donors’ primary consideration, either.Over the 41 years Campbell & Company has worked with nonprofit organizations, we have observed that the emotional impulse to give usually comes first. Additionally, in the 2016 U.S. Trust Study of High Net Worth Philanthropy, receiving a tax benefit did not rank in the top three motivators for charitable giving. People make philanthropic gifts for a number of reasons, so remind your donors why they care about your cause. Your case for support is a powerful driver of donors’ thoughts about giving, and it’s completely under your control. It’s imperative that your development team be able to speak knowledgeably about the TCJA provisions that could impact your organization. Encourage your team members to follow developments in tax reform; the National Council of Nonprofits’ collection of resources is a good place to start. By staying informed, your staff will be able to adjust strategies as needed and talk with supporters about the TCJA and how it may affect your organization. While you should never offer tax advice to donors, make sure you’re maintaining an open dialogue with your supporters about the TCJA. From your major gifts to your annual fund, donors need to understand the challenges your organization faces going forward. You can also use this opportunity to share and discuss the impact of their gift. If your mission is a top priority for them, they may be inspired to give more in response. Tax reform presented a critical opportunity for nonprofit advocacy, but the voices of leaders from our sector are still needed. Strive to build relationships with your local, state, and federal lawmakers. Every chance you have, articulate why your organization’s work is important—and why the nonprofit sector is an indispensable part of our economy and our society. When it comes to tax reform, so much remains in flux four months later. By staying knowledgeable, active, and on mission, you can prepare your organization to navigate the months and years ahead. Posted on February 28, 2018 at 11:54 am. Where do donor-advised fund grants go? CHICAGO—Donor-advised funds are frequently identified as one of the fastest-growing vehicles for charitable giving, but the question of where those donor-advised fund grant dollars go has remained largely unanswered until now. A new report is the first to uncover these answers. Among other findings, it identifies education, religion and public-society benefit organizations as the types of nonprofits that attracted the most donor-advised fund grant dollars, based on a sample of donor-advised fund sponsoring organizations from 2012 to 2015. The Giving USA Special Report, The Data on Donor-Advised Funds: New Insights You Need to Know, released on February 28, 2018, was researched and written by the Indiana University Lilly Family School of Philanthropy at IUPUI with support from Giving USA Foundation™ and the Fidelity Charitable Trustees’ Initiative. The Fidelity Charitable Trustees’ Initiative is a grantmaking program overseen by the trustees of Fidelity Charitable with a focus on increasing knowledge, information and resources that donors and nonprofits need to achieve their intended impact. The report presents new and important information about grants from donor-advised funds that financial advisors, nonprofit professionals including fundraisers, and philanthropists can learn from and apply. “Despite the growth in donor-advised funds in recent years, there has been little quantitative research on where the dollars go. The findings of this report can help demystify this important vehicle for charitable giving, including offering a clear comparison between how donor-advised funds’ granting patterns compare with the distribution of all types of charitable giving in Giving USA,” said Aggie Sweeney, CFRE, Chair of Giving USA Foundation. The report is based on original research by the Lilly Family School of Philanthropy. The school analyzed granting data from a small number of organizations that represented roughly half of all granting dollars from donor-advised funds between 2012 and 2015. The school used IRS Schedule I data and also collected direct granting data from donor-advised fund sponsoring organizations for the sample. Subsector categories were assigned to the organizations that received grants using National Taxonomy of Exempt Entities (NTEE) codes, the same process used to identify contributions to subsectors in Giving USA: The Annual Report on Philanthropy. Compared to the distribution of total U.S. giving as identified by Giving USA, grants from donor-advised funds give a greater share of their giving to education and less to religion. Giving to education comprised 28 percent of giving from donor-advised funds from 2012 to 2015. For the same time period, giving to education in Giving USA comprised only 15 percent of total giving. In contrast, grants to the religion subsector represented 14 percent of giving from the donor-advised fund sample, while giving to the religion subsector represented 32 percent of total giving in Giving USA. The distribution patterns by donor-advised funds track more closely with the trends of high-net-worth donors, who tend to give a larger share of their giving to education than to religion, a trend that was echoed in the study. The study found that granting patterns from donor-advised funds are relatively stable, with each different type of nonprofit receiving a similar percentage of total donor-advised fund giving from year to year. The report also features new aggregate estimates for donor-advised fund assets, number of donor-advised fund accounts in the U.S., and total dollars contributed to donor-advised funds, finding strong growth in every category between 2008 and 2014. Other sections of the report include a focus on the history of donor-advised funds, costs and benefits, and the future of donor-advised funds in light of recent changes to tax policy. Granting patterns from donor-advised funds are often difficult to track, in part because there is no single source of data that can be used to identify them. Although IRS Form 990 Schedule I requires organizations that house donor-advised funds to record granting data, the grants from donor-advised funds are not separated from other grants the organization makes, so studies must work with individual donor-advised fund sponsors to get accurate data that tracks the grants solely from donor-advised funds. In addition, there are other issues associated with Schedule I data, including that the forms may not be available in machine-readable format, meaning someone would have to enter granting data by hand. The Giving Institute and Giving USA Foundation hosted a live webcast on Thursday, March 1, from 1:00-2:30 p.m. Central, where expert panelists discussed the new Giving USA Special Report The Data on Donor-Advised Funds: New Insights You Need to Know. During the free webcast, attendees asked their most pressing questions about donor-advised funds and how to incorporate this giving vehicle into their fundraising plans. View the free recording here. Advancing the research, education and public understanding of philanthropy is the mission of Giving USA Foundation, founded in 1985 by The Giving Institute. Headquartered in Chicago, the Foundation publishes data and trends about charitable giving through its seminal publication, Giving USA, and quarterly reports on topics related to philanthropy. Published since 1956, Giving USA is the longest running, most comprehensive report on philanthropy in America. Giving USA 2017: The Annual Report on Philanthropy for the Year 2016 is available now at www.GivingUSA.org. 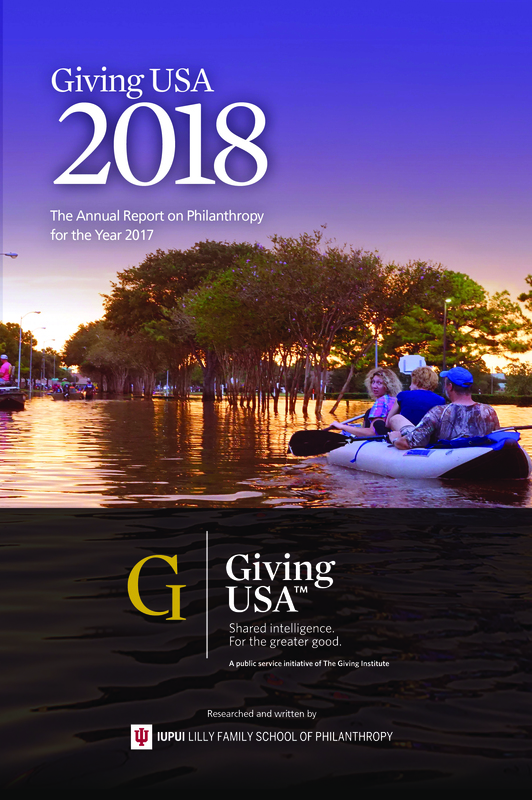 Giving USA 2018: The Annual Report on Philanthropy for the Year 2017 will be available on June 12, 2018. Read more about Giving USA Foundation’s history, as well as the history of Giving USA and philanthropy in the U.S. in the Giving USA 2015 Spotlight: Celebrating Service to Philanthropy (available as a free download on www.GivingUSA.org). The Giving USA Special Report on The Data on Donor-Advised Funds: New Insights You Need to Know is available for $24.95 in digital PDF format or as a paperback book (with digital download) for $29.95. Posted on October 24, 2017 at 9:18 am. Religiously affiliated people more likely to donate, whether to place of worship or other charitable organizations, new report finds. Special Report on Giving to Religion from Giving USA Foundation™ and the Lilly Family School of Philanthropy explores religious giving in an era of declining affiliation and attendance. The Giving USA Special Report on Giving to Religion released on October 24, 2017, was researched and written by the Lake Institute on Faith & Giving at the Indiana University Lilly Family School of Philanthropy with support from the Giving USA Foundation™. The report is based on newly released data from the Lilly Family School of Philanthropy’s Philanthropy Panel Study (PPS), which tracks more than 9,000 individuals’ and families’ giving and dynamic factors that influence those practices (e.g., employment, health and marital status) throughout their lives. PPS is the leading and most accurate resource for measuring U.S. household giving. People who are religiously affiliated are more likely to make a charitable donation of any kind, whether to a religious congregation or to another type of charitable organization. Sixty-two percent of religious households give to charity of any kind, compared with 46 percent of households with no religious affiliation. Although the percentage of people who give to religious congregations is declining, those who give to religion are giving at steady rates. Contrary to popular belief, younger generations do give to religion, and those who give are doing so at a similar rate as earlier generations did at the same point in their lives. Frequent attendance at religious services is linked to both the likelihood of giving to religion and to making larger gifts to religion. People who attend religious services on a monthly basis are 11 times more likely to give to religious congregations, and they give an average of $1,737 more to religion per year than people who attend less than once a month. Donors to religious causes between the ages of 40 and 64 give the largest amounts, giving an average of $2,505 per year. Donors to religious causes who are younger than 40 years old give an average $1,892 and donors who are 65 or older give an average of $2,338. Giving to religion increases as donors’ income increases, but donations decrease as a share of donors’ overall income. Households with an annual income greater than $100,000 give an average of $1,600 more to religion per year than households with an income of less than $50,000. Religiously affiliated households give as much or more to other types of charities as non-religiously affiliated households do. Una Osili, Professor of Economics and Associate Dean for Research and International Programs, Indiana University, Lilly Family School of Philanthropy; and Kashif Shaikh, Co-Founder and Executive Director of the Pillars Fund. Broadcast live from Chicago from 11:00am-12:30pm CDT, the live webcast is free for all to attend. Learn more and register for this complimentary webcast here. Advancing the research, education and public understanding of philanthropy is the mission of Giving USA Foundation, founded in 1985 by The Giving Institute. Headquartered in Chicago, the Foundation publishes data and trends about charitable giving through its seminal publication, Giving USA, and quarterly reports on topics related to philanthropy. Published since 1956, Giving USA is the longest running, most comprehensive report on philanthropy in America. Giving USA 2017: The Annual Report on Philanthropy for the Year 2016 is available now at www.GivingUSA.org. Read more about Giving USA Foundation’s history, as well as the history of Giving USA and philanthropy in the U.S. in the Giving USA 2015 Spotlight: Celebrating Service to Philanthropy (available as a free download on www.GivingUSA.org). The Giving USA Special Report on Giving to Religion is available for $24.95 in digital PDF format or as a paperback book (with digital download) for $29.95.